One of the most significant German artists of the postwar generation, Günther Förg’s (1952 – 2013) pioneering cross-disciplinary practice questioned artistic conventions, which he explored through series of works that attempted to decipher histories, misreadings, and the conflicted relationships surrounding the legacy of modernism’s aesthetics, often returning to themes that preoccupied him throughout the entirety of his career. In the breadth of his production, from monochrome painting to color studies, from photography to wall paintings, from bronze reliefs to sculpture, Förg explored what critic Kristy Bell describes as ‘the visual field,’ swiftly moving between and changing mediums with an abruptness that so characteristically defined the artist and his work. Using the language of abstraction in his painting practice, Förg appropriated tropes borrowed from modern art and architecture in unceasing transformations of color, form, and composition, imitating or reacting against gestures or principles of picture-making that he would push to limitations or extremes and then employ anew. His work contains references to modernist masters, such as Barnett Newman, Clyfford Still, Mark Rothko, and Edvard Munch, all of whom Förg greatly admired and held in high regard. Förg obsessively engaged with the pictorial practice of his predecessors, liberally borrowing techniques and tropes of modernist painting with an uninhibited and candid approach to imitation, appropriation, and influence. Born in Füssen, a region in Allgäu, Germany, Günther Förg’s career began in the early 1970s as a student at the Academy of Fine Arts in Munich, where he studied from 1973 to 1979 under Karl Fred Dahmen, one of the most important and highly influential figures of Art Informel, a school of abstraction that emphasised gestural techniques. His pioneering cross-disciplinary practice questioned artistic conventions, which he explored through series of works that attempted to decipher histories, misreadings, and the conflicted relationships surrounding the legacy of modernism’s aesthetics, often returning to themes that preoccupied him throughout the entirety of his career. Looking back to an artistic vocabulary belonging to his early career, Förg’s work from the 1990s revisits the monochromatic and straight lined. 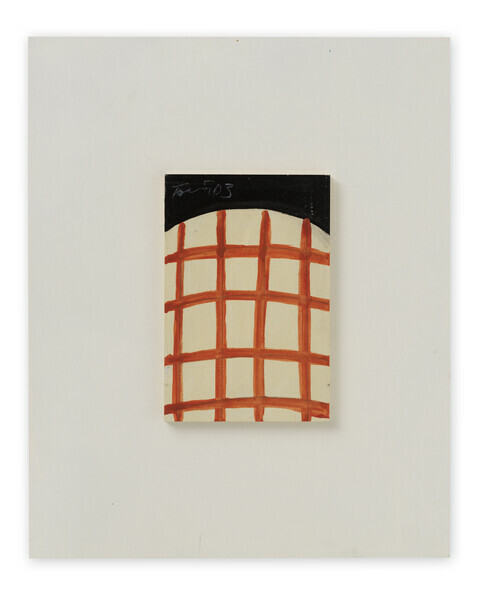 Shifting his focus, however, to an interrogation of gestural mark-making, the classic form of the grid simultaneously appears as a repeated motif that is transformed and manipulated through the artist’s expressive application of paint. 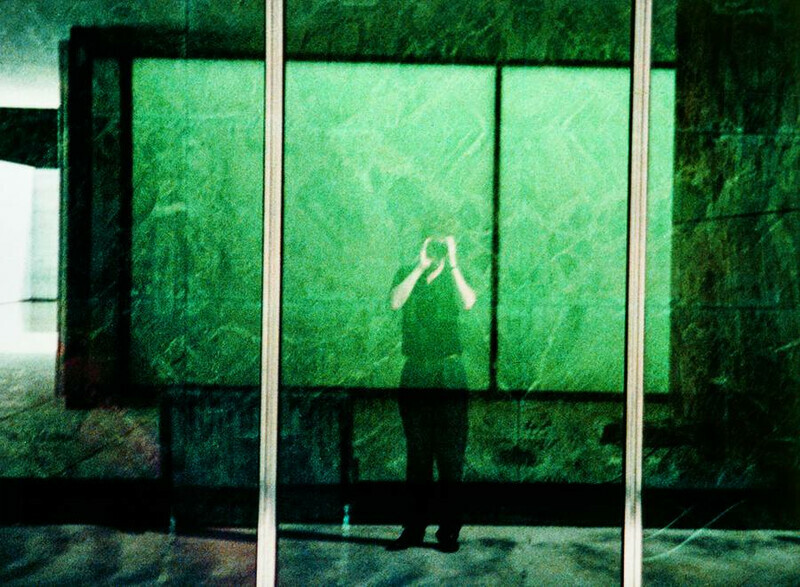 Between 1988 and 1998, in a project entitled ‘Barcelona Pavillion,’ Förg photographed Mies van der Rohe’s German Pavilion that had been built for the International Exposition of 1929 and was reconstructed in 1986. In these photographs he captures doors and window frames that inflect Barnett Newman’s ‘zips.’ They appear as vertical marks – stripes – pressed upon the picture and direct the viewer’s attention to the surface of the photograph rather than to the illusionary space that the image depicts. The canvases of 1999 to 2001 similarly reflect these conceptual influences. 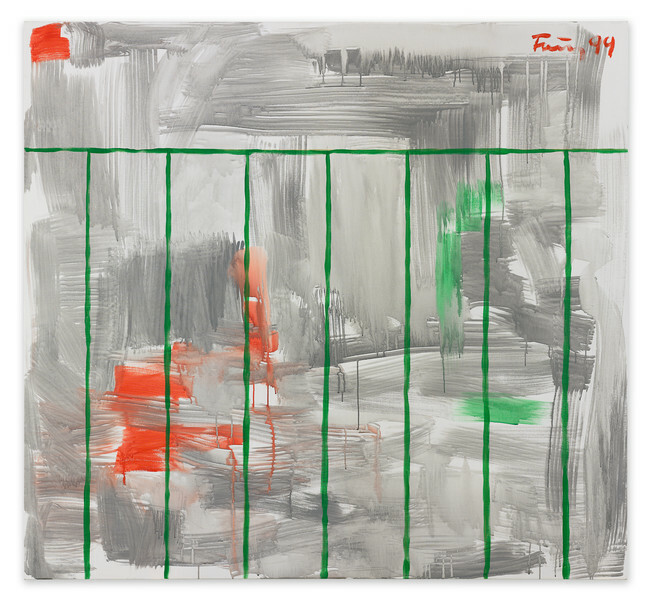 Offering variations on a theme, the grid – which also established the inner structure of the artist’s Window Paintings (particularly those of 1992 and 1993) – is layered on top of Förg’s expressive, gestural backgrounds. The grid-like structures or vertical bands rendered in high contrast colors allude to the influence of Newman’s ‘zips’ as much as to architectural references, suggesting window panes or balcony balustrades, to the Fascist era constructions of the IG Farben Haus in Frankfurt and Bauhaus buildings in Tel Aviv, which Förg had been documenting during these years. At same time these works recall the artist’s 1970s Grey Paintings. Creating canvases of material sensuality, each brushstroke becomes visible: from dense opaque washes of charcoal and lead to areas of smokey haze and near- transparent surfaces of silvery white. Inflected with striking smudges and drips of color in yellow, orange, and green, Forg’s expressive hand commands a rhythmic spontaneity and freedom that foreshadows the trajectory and summation of the artist’s last works. Förg first executed the Grey Paintings in 1973 as a student at the Academy of Fine Arts in Munich and continued the series until his death in 2013. Dense, elegant works, the paintings evidence the artist’s ever evolving relationship with the monochrome and investigations of materiality. Grounding his practice and laying the foundation for the artist’s entire oevure, these works demonstrate the beginnings of Förg’s lifelong commitment to a conceptual approach to art-making. 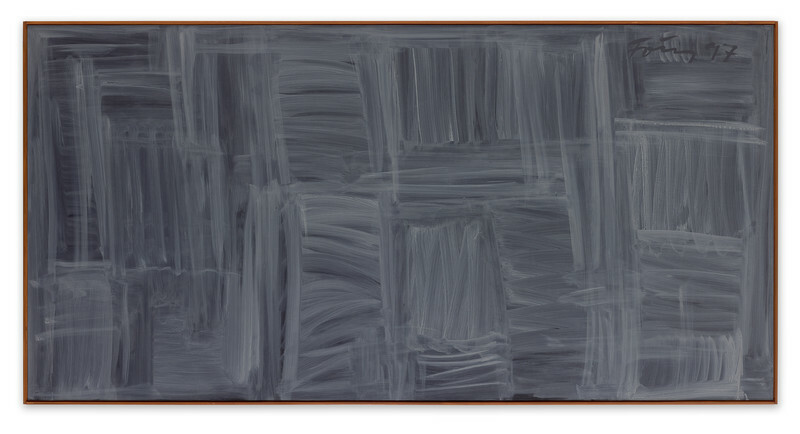 They call to mind both Joseph Beuys’s blackboard lecture drawing and Cy Twombly’s chalkboard paintings from 1967 – 1971, which Förg had visited during an exhibition of Twombly’s work at the Lenbachhaus in Munich during the summer of 1973. 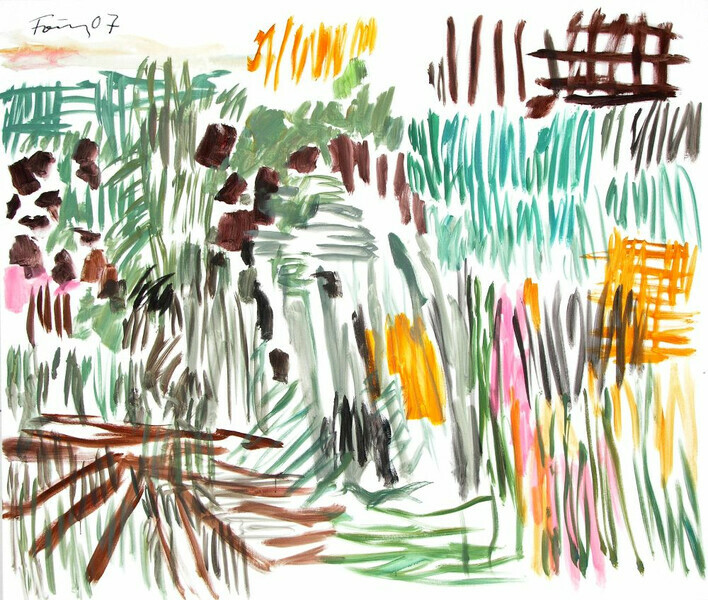 The experience, he recalls, was revelatory and motivated Förg to produce one new painting each week over a period of three years. Employing modest, cheap, and readily available materials, he primed his canvases in black before applying layers of acrylic paint with a sponge to create an emulsified effect in tonal shades of grey. The result emulated a blackboard onto which white chalk had been wiped, leaving behind a milky, translucent veil. Gradually, what had been a dogmatic exercise in reduction and refusal, a physical activity that seemed to undermine the very nature of painting as a medium, became a process of accretion: of slowly opening up painting as a problematic genre and re-integrating and examining elements of color, composition, movement, and gesture. 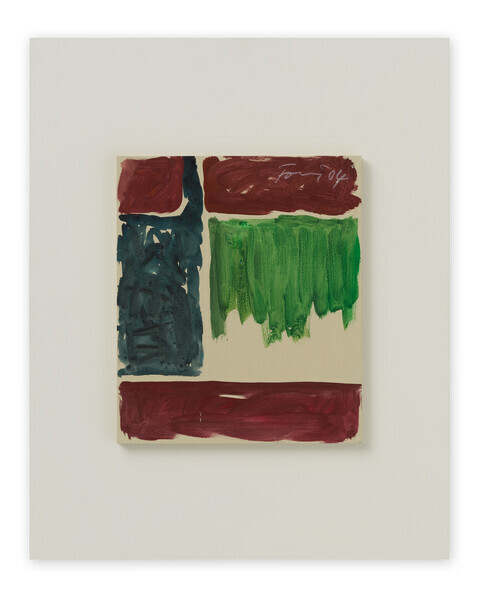 By the mid-1990s, the Grey Paintings had become gesturally dense, their nimble execution, tonal complexity, and compositional layering implicitly referenced the breadth of materiality diversity and depth of surface that Förg instigated and explored throughout his practice. Most immediately resembling the grid-like cross hatching of the artist’s Gitterbilder or Grid Paintings, these late career works make visible the material physicality and textural depth of the 1970s Lead Paintings, the window motif recurrent in Förg’s architectural photography dominating the 1980s, and the gauged, painterly quality of the undulating surfaces so characteristic of his bronze sculptural practice of the 1990s. The Grey Paintings from the 1990s remain touchstones of Förg’s artistic practice, uniting a sensual, expressive handling of formal disciplines and geometric structures. Förg obsessively engaged with the pictorial practice of his predecessors, liberally borrowing techniques and tropes of modernist painting with an uninhibited and candid approach to imitation, appropriation, and influence. He possessed a deep and vast knowledge of art and art history. Well read, he maintained an extensive arts library throughout his career, complete with over three thousand titles. 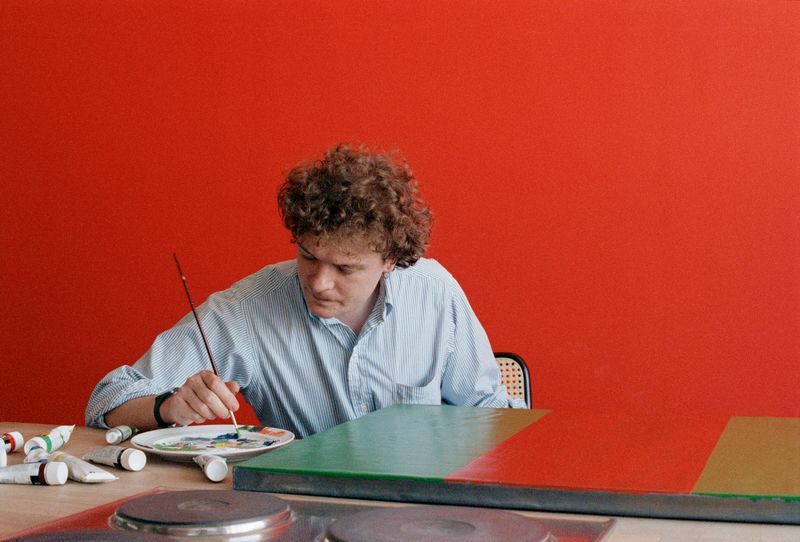 Like his contemporaries, Martin Kippenberger and Albert Oehlen, Förg possessed a keen self-awareness and his work exhibits an attitude that sought ‘the freedom to synthesise things.’  Testing the possibilities and limitations of the disciplines he engaged, his practice expanded the narratives of painting proposed by painters who grasped the potential of color and form. From Barnett Newman to Clyfford Still, Mark Rothko, Philip Guston, Paul Klee, Blinky Palermo, Cy Twombly, and Robert Ryman, among others, Förg’s physical and sensuous approach to material culls gestures and principles from the aesthetics of modernism, adding them to the tools and means of his art-making as a conceptually significant aspect of his practice. Hauser & Wirth will participate in the first edition of Taipei Dangdai with a solo booth by Günther Förg. Titled ‘Waterfront,’ the presentation is comprised of over 30 works sourced directly from the Estate. This month, Hauser & Wirth will present its first exhibition devoted to Günther Förg since announcing representation of the artist’s estate. ‘Günther Förg. Works from 1986 – 2007’ opens on Thursday 24 January 2019 at Hauser & Wirth New York, 22nd Street.